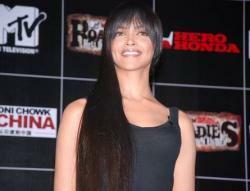 Bollywood’s latest action girl Deepika Padukone was spotted at the launch of MTV’s reality television show Roadies 6.0. Deepika, who is currently sporting a Chinese look, will be seen in an all new action girl avatar in the forthcoming Akshay Kumar starrer Chandni Chowk to China. According to media reports, Deepika will play a dual role (Indian and Chinese) in the movie, and would give tough competition to Akshay Kumar in the martial arts department.